Scientists are beginning to understand a historic solar storm in 1859. One day, they say, it could happen again. October 23, 2003: Newly uncovered scientific data of recorded history's most massive space storm is helping a NASA scientist investigate its intensity and the probability that what occurred on Earth and in the heavens almost a century-and-a-half ago could happen again. Right: An ultraviolet-wavelength picture of the sun taken by the ESA/NASA Solar and Heliospheric Observatory (SOHO) on Oct. 23, 2003. In scientific circles where solar flares, magnetic storms and other unique solar events are discussed, the occurrences of September 1-2, 1859, are the star stuff of legend. Even 144 years ago, many of Earth's inhabitants realized something momentous had just occurred. Within hours, telegraph wires in both the United States and Europe spontaneously shorted out, causing numerous fires, while the Northern Lights, solar-induced phenomena more closely associated with regions near Earth's North Pole, were documented as far south as Rome, Havana and Hawaii, with similar effects at the South Pole. What happened in 1859 was a combination of several events that occurred on the Sun at the same time. If they took place separately they would be somewhat notable events. But together they caused the most potent disruption of Earth's ionosphere in recorded history. "What they generated was the perfect space storm," says Bruce Tsurutani, a plasma physicist at NASA's Jet Propulsion Laboratory. To begin to understand the perfect space storm you must first begin to understand the gargantuan numbers with which plasma physicists like Tsurutani work every day. At over 1.4 million kilometers (869,919 miles) wide, the Sun contains 99.86 percent of the mass of the entire solar system: well over a million Earths could fit inside its bulk. The total energy radiated by the Sun averages 383 billion trillion kilowatts, the equivalent of the energy generated by 100 billion tons of TNT exploding each and every second. But the energy released by the Sun is not always constant. Close inspection of the Sun's surface reveals a turbulent tangle of magnetic fields and boiling arc-shaped clouds of hot plasma dappled by dark, roving sunspots. Once in a while--exactly when scientists still cannot predict--an event occurs on the surface of the Sun that releases a tremendous amount of energy in the form of a solar flare or a coronal mass ejection, an explosive burst of very hot, electrified gases with a mass that can surpass that of Mount Everest. 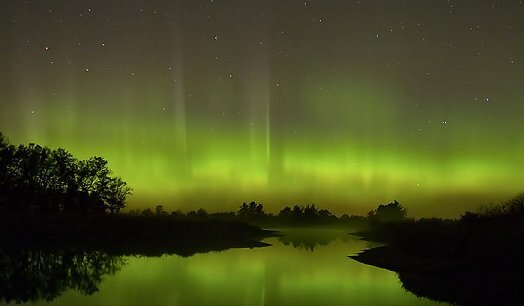 Below: These Northern Lights appeared over Wisconsin on Oct. 22, 2003. During the superstorm of 1859, such lights appeared as far south as Cuba and Hawaii. Photo copyright Chris VenHaus. What transpired during the dog days of summer 1859, across the 150 million-kilometer (about 93 million-mile) chasm of interplanetary space that separates the Sun and Earth, was this: on August 28, solar observers noted the development of numerous sunspots on the Sun's surface. Sunspots are localized regions of extremely intense magnetic fields. These magnetic fields intertwine, and the resulting magnetic energy can generate a sudden, violent release of energy called a solar flare. From August 28 to September 2 several solar flares were observed. Then, on September 1, the Sun released a mammoth solar flare. For almost an entire minute the amount of sunlight the Sun produced at the region of the flare actually doubled. "With the flare came this explosive release of a massive cloud of magnetically charged plasma called a coronal mass ejection," said Tsurutani. "Not all coronal mass ejections head toward Earth. Those that do usually take three to four days to get here. This one took all of 17 hours and 40 minutes," he noted. Below: SOHO coronagraphs captured this movie of a coronal mass ejection (CME) heading toward Earth on Oct. 22nd. NOAA forecasters expect the CME to cause a geomagnetic storm when it reaches Earth on or about Oct. 24th, but not as severe as the superstorm of 1859. Not only was this coronal mass ejection an extremely fast mover, the magnetic fields contained within it were extremely intense and in direct opposition with Earth's magnetic fields. That meant the coronal mass ejection of September 1, 1859, overwhelmed Earth's own magnetic field, allowing charged particles to penetrate into Earth's upper atmosphere. The endgame to such a stellar event is one heck of a light show and more -- including potential disruptions of electrical grids and communications systems. Back in 1859 the invention of the telegraph was only 15 years old and society's electrical framework was truly in its infancy. A 1994 solar storm caused major malfunctions to two communications satellites, disrupting newspaper, network television and nationwide radio service throughout Canada. Other storms have affected systems ranging from cell phone service and TV signals to GPS systems and electrical power grids. In March 1989, a solar storm much less intense than the perfect space storm of 1859 caused the Hydro-Quebec (Canada) power grid to go down for over nine hours, and the resulting damages and loss in revenue were estimated to be in the hundreds of millions of dollars. "The question I get asked most often is, 'Could a perfect space storm happen again, and when?'" added Tsurutani. "I tell people it could, and it could very well be even more intense than what transpired in 1859. As for when, we simply do not know," he said. To research the "perfect space storm" of 1859, Tsurutani and co-writers Walter Gonzalez, of the Brazilian National Space Institute, and Gurbax Lakhina and Sobhana Alex, of the India Institute of Geomagnetism, used previously reported ground, solar and auroral observations, and recently re-discovered ground-based magnetic- field data from Colaba Observatory in India. The findings were published in a recent issue of the Journal of Geophysical Research. The Hydro-Quebec Blackout of March 1989 -- On March 13, 1989, at 2:44 am, a transformer failure on one of the main power transmission lines in the HydroQuebec system precipitated a catastrophic collapse of the entire power grid. Geomagnetic Storms Can Threaten Electric Power Grid -- The sprawling North American power grid resembles a large antenna, attracting electrical currents induced by giant solar storms. The Biggest Explosions in the Solar System -- (Science@NASA) NASA's RHESSI spacecraft aims to unravel an explosive mystery: the origin of solar flares. Solar Flares on Steroids -- (Science@NASA) Solar flares that scorch Earth's atmosphere are commonplace. But scientists have discovered a few each year that are not like the others: they come from stars thousands of light years away.